The top managers at Markel International, the insurer and reinsurer formed following US insurer Markel Corporation’s purchase of Terra Nova a decade ago, have clearly spent a lot of time together. 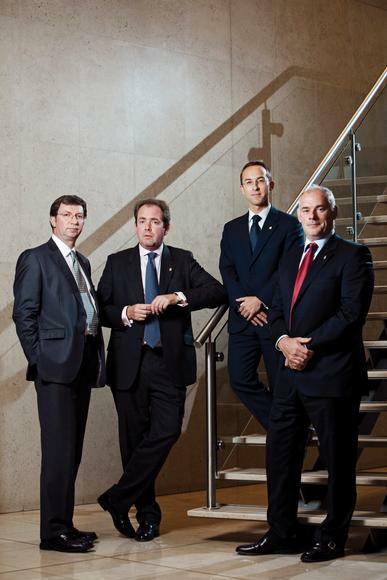 The four people in the room – chief operating officer William Stovin, insurance company president and syndicate active underwriter Jeremy Brazil, finance director Andy Davies and chief actuary Nick Line – are not shy of interrupting each other to flesh out ideas or finish one another’s sentences. This is hardly surprising: Stovin, Davies and Line are Terra Nova old guard. Yet all four say this united front is a world away from the company Markel bought at the turn of the millennium. It consisted of eight Lloyd’s syndicates under the Octavian Syndicate Management banner, as well as a London market operation, Terra Nova Insurance Company, French reinsurer Corifrance, Bermudan insurer Terra Nova (Bermuda) Insurance Company and a Bermudan holding company. There were also offices in Belgium, Australia, Hong Kong and Canada. And the structure did nothing for the company’s structural integrity. “With eight syndicates, two companies and other bits around the edge, there was massive infighting, with nobody feeling part of anything in particular,” says Stovin. The company was also in poor financial shape. It was clear that drastic and speedy action was needed to fix Terra Nova. Over nine months, its sprawling operations were whittled down to Syndicate 3000 and Markel International Insurance Company, the London market insurer. The Bermuda operation was closed, Corifrance and the Hong Kong operation sold, and the Brussels operation and Australian unit – dubbed by Stovin a “total disaster” – shut. As well as bringing together the underwriting, they consolidated the back-office functions. The new-look Markel International was organised round six divisions: marine, aviation, reinsurance and specialty, professional and financial risks, retail and property. Its book was pared back from $900m (£564m) annual gross premium to $650m. With the reserves taken care of, the company set about focusing on underwriting profitability, measured using a US GAAP combined ratio rather than the loss ratio typical in Lloyd’s. Coupled with this, the company put its underwriters on bonuses tied to underwriting profitability. Markel International also ushered in a new corporate culture to unify the firm. In a departure from Terra Nova days, underwriters worked across both the syndicate and insurance firm. The shift involved a healthy dose of US-style corporate culture. Today, the four men’s suits are adorned with gold Markel lapel pins, reminiscent of the blue and gold badges Joe Plumeri introduced at Willis when he came over from the US to run the broker in 2000. And just as Willis has the ‘Willis way’, Markel International now has the ‘Markel style’ – a five-line summary of its ethos. But it’s hard to argue with the new style. It has ensured the right people have stayed with Markel and it has resulted in a combined ratio of 91% in 2009 on the back of $52m in underwriting profit. The company has made underwriting profits in two of the past three years, only missing 2008 because of hurricanes Ike and Gustav. Heavy losses in the first half of 2010 led to an underwriting loss for the first six months and a combined ratio of 112%. But Stovin says losses from the Chilean earthquakes and Deepwater Horizon – $15m each – were within the firm’s expectations. If there are no further big losses, the company hopes to make an underwriting profit for the full year. “Historically, we tend to be conservative in the first two quarters and the second half of the year tends to be stronger,” says Davies. While market conditions are challenging, with rates softening in both commercial insurance and reinsurance, Markel International is looking to grow. Since stripping back Terra Nova’s office network, it has begun to expand globally and has offices in Madrid, Stockholm and Singapore. The Singapore office writes business for Syndicate 3000 via the Lloyd’s trading platform in Singapore. The company has made a series of acquisitions. In October 2009, it bought Canadian managing general agency Elliot Special Risks and in July it expanded its equine business by acquiring French broker and coverholder Le Centaure. The firm also launched a trade credit division in April after hiring a team of underwriters from ACE.